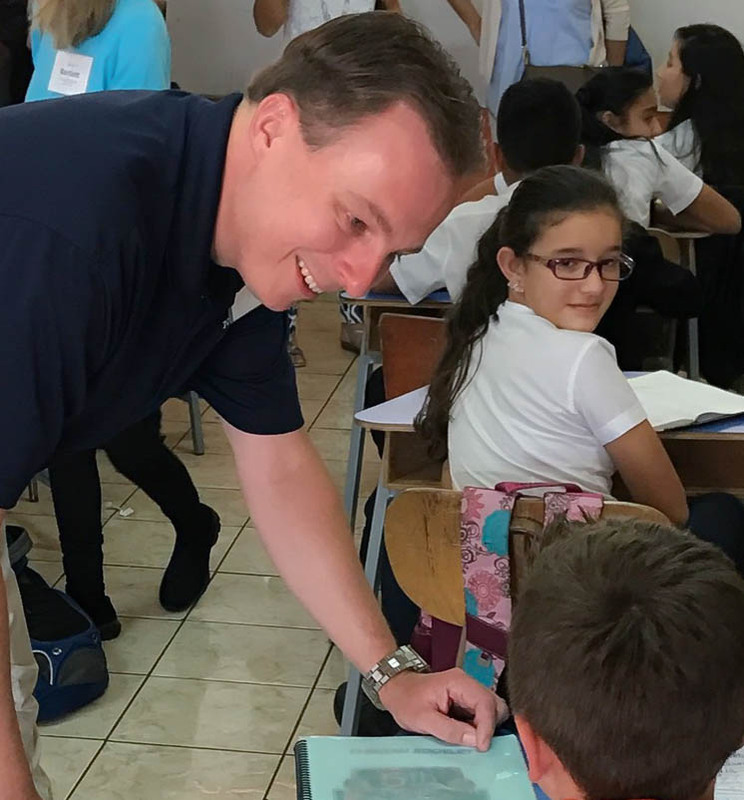 NSBA President-Elect Kevin Ciak with students at the Leon Cortes Castro School in Costa Rica. Alajuela, Costa Rica – Marisel Solera is the spunky principal of the Leon Cortes Castro School in this Costa Rican mountain town. Solera has been running the school for nine years, and she leaves no doubt that she is in charge and ready to get her students the best education that she can offer to them. Almost half of her school budget goes toward feeding her kids. Every one of them gets a free lunch every day. There is nothing modern about the facility but it is clean and well maintained. Solera is big on discipline and has little tolerance for misbehavior from her students or her staff. But her commitment to her students and her school is firm. When teachers are absent, she is the sub. When everyone else is on vacation, she’s recruiting teachers to make sure she has her full complement of staff. The school has an enthusiastic core of volunteers that greatly respect the principal and engage in fund raising to meet whatever needs are not met by government funding. Solera is not reluctant to take on the bureaucracy and admits to having been called on the carpet after objecting too strenuously to not receiving what her children need. I suspected that among our group of visiting educators from the U.S., many were dreaming about having Solera heading up one of their elementary schools. This entry was posted in Education and tagged AASA Executive Director Dan Domenech, AASA in Costa Rica, AASA International Seminar, Education in Costa Rica by Dan Domenech. Bookmark the permalink.